Religious divisions can be the hardest and most bitter to overcome. Consider this: when Jesus was ministering in 1st century Palestine in Roman-occupied Jewish territories, where did he experience the most friction? Was it from Roman rulers? Was it from masses of people who were offended by his teachings? Not even close. It was from the religious leaders. The Saducees you could understand why they were against him: with no belief in an afterlife, their hold on the temple was their only shot at serving God and enjoying life (look at Matthew 22:23ff). But the scriptural Pharisees should have known better, right? They went round and round with Jesus (see John 9:39ff for one of many examples in all four gospels). Holding onto control and power? There was some of that. But also there was disagreement over deeply held beliefs. Some of those deeply held beliefs became wedges between them and God. It was just hard. Bad attitudes only compounded the difficulty for the Lord. Ultimately the cross was the only way forward. 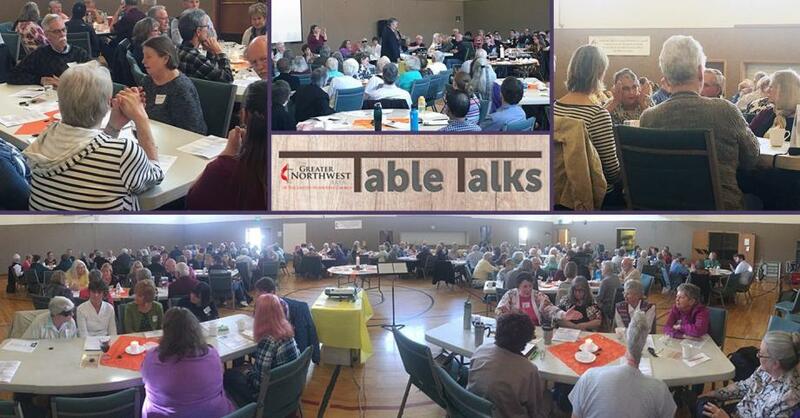 This Saturday, May 12th, from 10:00 a.m. to 2:00 p.m. @ Olympia First United Methodist Church, clergy and laity from our denomination will be gathering for a “Table Talk” on human sexuality. We are going to practice respectful, loving conversation and debate about the issues that are flash-points for conflict. I will be attending, and anyone is welcome to come and be part. You can RSVP here. I am expecting at least a couple of our church's leaders will accompany me. Do I relish this opportunity, knowing that I will represent a tiny minority who uphold a traditional approach to sexual ethics that is informed by face-value statements from the Bible in context? No, I don't. But I am happy to live out my calling to be a voice for orthodox, classic expressions of the Christian faith in a region where progressive approaches have dominated for decades. This is hard to talk about. But it doesn't mean that we shouldn't. If we can't talk about it, there's something even bigger that's going wrong. If you want to come, RSVP with the Conference, and let me know: john.sumc@gmail.com. I'm happy to give a ride to whoever wants to come. You don't even have to agree with me. Everyone has a voice. Part of the Good News is that having the right opinion about every issue is not what gets us into heaven: it's the cross of Jesus. Proverbs 15:1-4 A gentle answer turns away wrath, but harsh words stir up anger. 2 The wise person makes learning a joy; fools spout only foolishness. 3 The LORD is watching everywhere, keeping his eye on both the evil and the good. 4 Gentle words bring life and health; a deceitful tongue crushes the spirit. Titus 3:1-2 Remind your people to submit to the government and its officers. They should be obedient, always ready to do what is good. 2 They must not speak evil of anyone, and they must avoid quarreling. Instead, they should be gentle and show true humility to everyone. James 3:17-18 17 But the wisdom that comes from heaven is first of all pure. It is also peace loving, gentle at all times, and willing to yield to others. It is full of mercy and good deeds. It shows no partiality and is always sincere. 18 And those who are peacemakers will plant seeds of peace and reap a harvest of goodness. John 13:34-35 34 “So now I am giving you a new commandment: Love each other. Just as I have loved you, you should love each other. 35 Your love for one another will prove to the world that you are my disciples."